A fashionista has had a loooooong week. As I mentioned earlier, the kids are back to school and I'm still getting them adjusted, with their schedules as well as dealing with the loss of a dear friend and mentor. Tres Chic Style is very much a part of my life. While I've been hard at work restructuring the Tres Chic Brand and concentrating on my latest philanthropic ventures I've had little time to update my fiercely loyal readers about the latest in fashion, celebrity news and style advice. I apologize for my absence but assure you of my commitment to this fabulous blog. The holidays are quickly approaching and I've already begun to compile my Holiday Favorites List. We are so looking forward to our 2nd Annual "Tres Chic Style 12 Days of a Chic Christmas" Holiday Contest. Details and information will be posted soon. Fashionistas, set your alarms and be prepared to fight the crowds for the chance to score serious savings at the Target Pop Up stores, featuring 22 designer collaborations. *Other locations include 57th Street and 6th Avenue, Broadway between 11th and 12th Streets, and Bowery and 2nd Street. 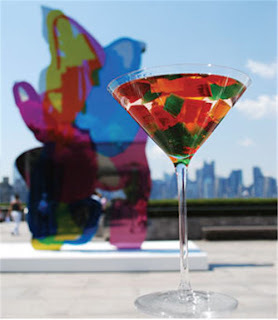 What: The cocktail (pictured above) looks like a work of art, which is fitting because it was concocted in honor of a famous work of art. To capture the child like spirit of the piece colored cubes of Jell-O are added. The colorful cubes contain vodka, tequila, triplesec, rum, gin and Sprite to create a drink that tastes like a sweet Long Island Iced Tea.